More than 55 percent of DCCCD students say they can’t afford to eat balanced meals and 31 percent responded that they’ve been hungry but didn’t eat because there wasn’t enough food, according to a 2016 survey. Combatting food insecurity has become a districtwide initiative for the Dallas County Community Colleges, and Eastfield is establishing its own on-site food pantry through a partnership with North Texas Food Bank. 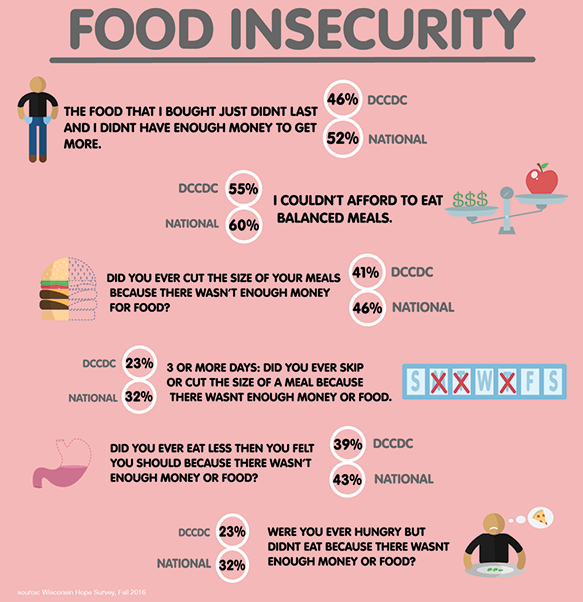 The survey taken by Wisconsin Hope Lab in Fall 2016 showed that food insecurity — not having access to enough affordable or nutritious food — may be an issue affecting more than half of college students in DCCCD and across the nation. Katy Launius, associate dean of the Office of Student Engagement and Retention, said the study revealed that a shocking level of undergrads, at two-year institutions and technical colleges especially, struggle with food insecurity. This challenge, she said, doesn’t end with the graduation from high school. Students may be choosing between buying books or purchasing groceries, a decision they shouldn’t have to make, she said. Launius is leading the initiative until a director for the new Center for Equity, Inclusivity and Diversity is in place, and is optimistic that it will open by the end of the fall semester. Desiree Dillon, the senior manager of partner agency resources for the North Texas Food Bank, said the pantry would provide a resource for students so that they won’t have to choose between school and food. Dillon said that when she spoke to campus representatives interested in setting up pantries, they wanted to help students face these challenges and move through college. 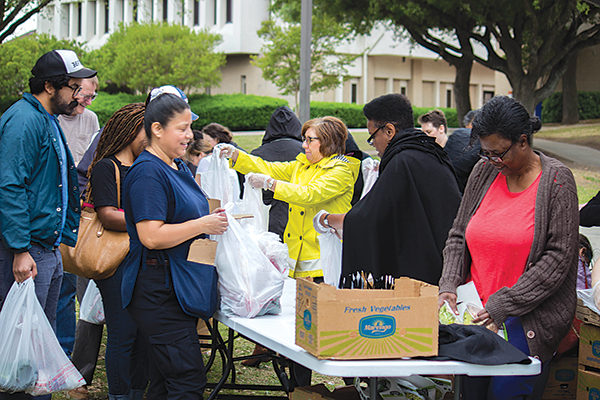 Volunteers hand out fresh produce during one of the North Texas Food Bank mobile pantry visits to campus. The Et Cetera file photo. The DCCCD campuses are all establishing their pantries at a different rate. Brookhaven, Mountain View, North Lake, and El Centro have them. Richland’s, Cedar Valley’s and Eastfield’s are in development. Dillon said that each campus pantry would be unique, based on space availability, volunteer resources, geographical location and faculty and staff support. Each school has various leadership structures and student populations with different needs. The partnership between DCCCD and the food bank means that each college will be able to purchase food at a cheaper rate and gain knowledge about what it takes to run a food pantry on campus. A three-pronged approach is being used to combat student hunger. It comprises a mobile pantry that travels from campus to campus delivering fresh foods, school visits from the food bank to sign-up students for social services like SNAP, formerly known as food stamps, and support from the food bank to set up on-site pantries. Students receiving assistance from the food bank or the pantry may be asked to fill out a survey. Dillon said this is a non-invasive way to determine what each person needs, and there won’t be questions about income. In a campaign called “Stock the Pantry,” the DCCCD Foundation exceeded its goal of raising $5,000 for each pantry over the summer. This campaign was to serve as seed money for the pantries opening across the district. Amanda Nguyen, assistant director of Human Resources at Eastfield, said she joined the fundraising team when her boss invited her because it’s a good cause. She said her team raised most of the money in two weeks. But raising the money is only a baby step. The next step will be to get the pantry up and running. DCCCD Foundation fund of their choice, and now the pantry will be on that list. “I’m hoping that the fundraising doesn’t stop here,” Nguyen said. Launius said the values of Eastfield like person-centeredness, diversity and fairness align closely with this mission. Sometimes people need help, she said, and the idea that they can simply work hard and pull themselves up by their bootstraps is false. She said it’s a myth of American exceptionalism that we’re a country of opportunity and everyone has equal access. Solutions like financial planning and budgeting won’t work if the money isn’t there to meet a student’s needs. The goal that Eastfield wants to work toward, Launius said, is serving as a comprehensive pantry because they know that students don’t just experience hunger momentarily. But the school must have enough space and capacity to make it happen.